Enjoy an afternoon of family fun on the ropes course at JCC Grossman Camp (294 Powissett Street) in Dover on Sunday, June 5 from 2-4pm. 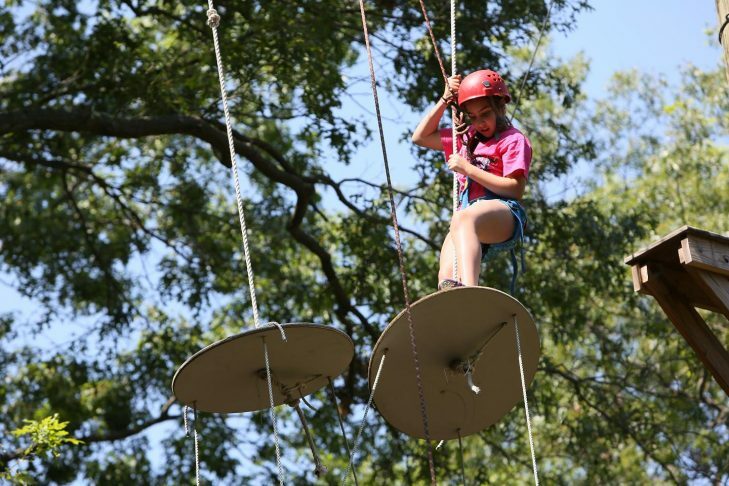 Be adventurous and try the Zipline or Swing Shot or fly through the air on the Flying Squirrel! Challenge yourself or just enjoy cheering one another on. This outdoor experience, facilitated by experienced Ropes Course Specialists, offers fun for all. We’ll work up an appetite and end with a special snack after climbing. Geared for families with children ages 5-10 years. Cost is $15/family if registered by Thursday, June 2; $5 additional fee for online registration after June 2 or at the door. Register at bostonjcc.org/MWRopesCourse. If rain is predicted for Sunday, June 5, this event will be held on Saturday, June 4. For more information, contact metrowest@jccgb.org or 508-879-3300. Generous funding provided by Combined Jewish Philanthropies MetroWest Jewish Community Grant Fund.